Despiértese con el aire fresco del lago Las Vegas, disfrute de su mañana y de la noche en el balcón con vista al agua desde el lago. Relajante complejo turístico de Lake Las Vegas a solo 20 millas de Las Vegas Strip. A pocos minutos de la maravillosa área de recreación del Lago Mead. SIN TARIFA DE RESORT Y Aparcamiento exterior gratuito. La unidad incluye una pequeña nevera, estufa, fregadero con desecho, microondas, lavaplatos, TV y conexión inalámbrica a internet gratuita. Una cama tamaño king en el dormitorio + un sofá cama en la sala de estar, el gimnasio y la piscina son de acceso gratuito. Las lavadoras y secadoras que funcionan con monedas están ubicadas en el área común del edificio. El Seasons Market y los restaurantes y salones se encuentran a solo 5 minutos a pie en el pueblo, al otro lado del puente. I booked this condo for my parents for a relaxing vacation after my mother’s retirement. They had so many positive things to say. They are not big travelers & had no issues with checkin or navigating their way around the property. The view was breathtaking & the location perfect. Room very comfortable & clean. They loved being able to wake up & enjoy the scenery of the lake & the mountains, walk across the bridge to the village for breakfast & dinner. They felt very relaxed & refreshed after 2 days on the strip & it was close to other areas they visited. They did mention it was difficult to find parking if there was something going on in the village & the WiFi was down at one point due to construction but other than that they can’t wait to return & bring the rest of the family! Thank you for providing such a relaxing getaway for my parents. The condo was well supplied and furnished, clean, and had great views of the pool/lake. It was very peaceful and we enjoyed our stay. The only issue we had was with the key to the building and suite not working one day (had to make two trips back to the main office to get it fixed). 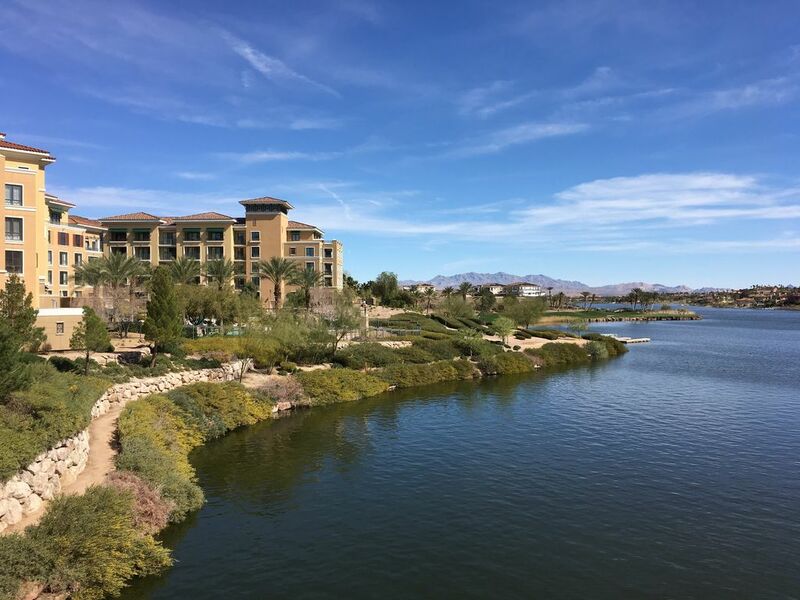 The Lake Las Vegas area is very quiet and beautiful and we enjoyed our stay in this condo! For my wife and I, this ended up being a great place to stay. The place was clean, and the location allowed us to relax more than if we had stayed on the strip. We didn't have any issues while staying, so we'd certainly look at staying here again should we make the trip back out to Vegas. Comfortable apartment with a good view. Has the basics, but some other rentals are a bit nicer. Very nice condo, perfect for 2 people. Great view from the balcony. Owner Linda was very helpful and responded quickly to all emails. Good location for visits to lake Mead Recreation Area and Valley of Fire State Park. Short walk to a few restaurants and grocery store in the village. Great location - this Condo is perfect for a get away or business trip away from the Vegas strip. The condo views are relaxing overlooking the pool, lake, village and mountains. The village is a few minute walk away to a grocery store, breakfast / coffee shops, evening entertainment including restaurants, bars and even a casino. The condo has all the basic amenities anyone could need. The airport is just 20-25 minutes away and Las Vegas strip is an easy 25-30 minutes away. If you like nature and outdoor activities this Condo is perfectly located because Lake Mead (25 minutes away), Hoover Dam (30 minutes) and Valley of Fire (an hour) are all relatively close. There are plenty of paths for walking and bike riding as well as a golf course near by. We just love coming and staying a while.